This is an exciting time in the electric vehicle (EV) landscape. Tesla just posted a profit for the first time, Volkswagen is helping to build up charging infrastructure across North America, and many other auto manufacturers are committing to an EV future. EVs are gaining traction and slowly transforming car-based mobility in the United States. 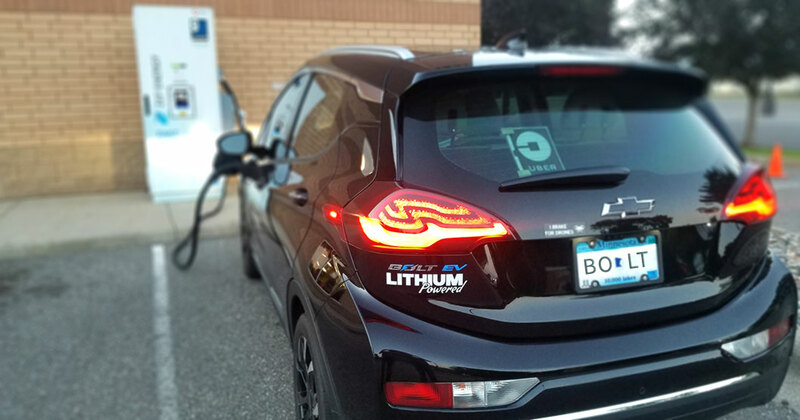 And here in the Metro and throughout Minnesota, momentum is growing with collaborative efforts to drive EV adoption and infrastructure development. While exploring one of the many areas where EVs are creating positive change, we caught up with two Lyft and Uber drivers to talk about their experience driving an EV for a ride sharing app. They told us all about the massive savings that have resulted from driving an EV, and we were delighted to discover that using an EV for a ride sharing app performs one of the most critical steps frequently identified in increasing EV adoption: getting people to experience EVs first hand. The experiences of Conlon and Ronning are consistent with what we’ve found to be true across our work in Minnesota: EVs are transformative. These ride-sharing service drivers also demonstrate how an EV meets the needs of even the most demanding of drivers, with these two easily driving hundreds of miles per day. If you are a driver for a ride-sharing service looking to get a new car, consider an EV. Your fuel and maintenance savings will add up very quickly. And if you’re just in the market for a new car, EVs are here, and they can deliver a range of enticing benefits, from lower maintenance and fuel costs to a positive driving experience and significantly lower carbon emissions.